Chat interpreters remove the language barrier by translating what each party types in near real-time. What are Online Chat Interpreters? Internet chat, sometimes known as Instant Messaging (IM), is becoming an increasingly popular way of communicating in business. Online Chat interpreters remove the language barrier by translating what each party types in near real-time. How does Online Chat interpreting work? There are many different chat platforms but they all work in a very similar fashion. The parties who wish to communicate log on the system and are able to chat to each other by typing on their computer keyboard. Unlike email where there is a delay, everyone involved in the chat can see the messages typed instantly. Your chat interpreter will join the online chat and begin translating what each party is typing a few seconds after they hit the return key. This allows the conversation to proceed naturally and in near-real time. We can work with publically available chat clients such as those offered by Skype or provide you with a private closed system if you are concerned about confidentitality. A useful feature of using chat interpreters is that with most systems, you can retain a text copy of the conversation for your records. 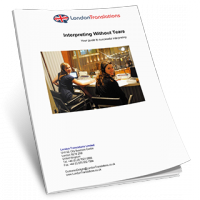 Depending on the level of specialised knowledge required, the timely provision of background information will greatly enhance the quality of the results your chat interpreters are able to provide.